B, T., K. Naveenkumar, J. Bodharthi, and S. Shivaprasad. “Antimicrobial Activity of Ethanolic Extract of Usnea Longissima”. 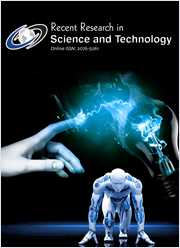 Journal of Experimental Sciences, Vol. 2, no. 12, Feb. 2012, https://updatepublishing.com/journal/index.php/jes/article/view/1898.